Roughly half of plastic products, such as packaging, are intended for one-time, short-lifespan (less than six months) applications prior to disposal. Given that most of these items are not biodegradable, and are not recycled, plastics waste is building up – with serious environmental consequences. NEWARK, NJ – Plastics are everywhere. Whether used to store leftovers, keep hospital equipment sterile, or insulate a home, plastics are unmatched for their adaptability, durability, and low cost. Given their seemingly boundless benefits, it is unsurprising that plastics have replaced traditional materials in many sectors – for example, steel in cars, paper and glass in packaging, and wood in furniture. As a result, annual plastics consumption worldwide has increased from five million tons in the 1950’s to around 280 million tons today. Roughly half of plastic products, such as packaging, are intended for one-time, short-lifespan (less than six months) applications prior to disposal. Given that most of these items are not biodegradable, and are not recycled, plastics waste is building up – with serious environmental consequences. While governments have begun to implement new (and often quite strict) regulations aimed at managing plastics waste – for example, China banned lightweight plastic shopping bags in 2008 – they are inadequate to address the world’s growing plastics-waste problem. Moreover, most plastic products are made from so-called “petroleum-based commodity thermoplastics.” Given that a non-renewable resource forms the basis of many plastic products – most of which will not last long – current plastics usage patterns are not sustainable. Closed-loop recycling, in which plastics waste is used to make another product, thus carries significant environmental benefits, such as reduced energy and oil consumption. But the process of separating the petroleum-based recyclable plastics from other kinds of plastics and solid waste is difficult, costly, and labor-intensive, so only a small proportion is recycled. In 1988, the United States Society of Plastics Industry (SPI) developed a coding system in which each kind of resin is labeled with a number, 1-7, to facilitate sorting. The system has also been used elsewhere, including in Canada and Switzerland, but has not been adopted worldwide and is still confusing to some consumers. If consumers knew to collect and separate household plastics based on their number, when available, the resulting boost to recycling efforts would demonstrate to government and industry the viability of a more sustainable approach, reduce exposure to rising oil prices, and support growing global demand for plastics. Given the difficulty and expense of separating plastics, the most economically viable option is often secondary recycling of a few commodity thermoplastics – mostly bottles, for which collection infrastructure is already in place. More economical separation methods are crucial to expanding the scope of plastics recycling, as is the identification of new potential markets for the recyclates. Such developments would encourage industry to re-use or recycle more parts. Although all 40 kinds of plastics used in a North American automobile can be recycled, the need to separate and clean them makes using them more expensive than using virgin plastic resins. This translates into a higher proportion of plastics in the remnants of shredded end-of-life automobiles – a contaminated mixture of plastics and non-plastics that is usually disposed of through some combination of landfilling, incineration, and secondary recycling. Increasing the proportion of re-used plastics is a crucial step toward more sustainable plastics consumption. To this end, some automobile manufacturers have adjusted their designs to allow for easy disassembly of parts made of compatible plastics, while governments have set recycling target proportions for end-of-life vehicles. Such efforts should be intensified. Furthermore, industry should seek new applications for recycled materials, while minimizing the amount of virgin material used. And, where possible, manufacturers should “down-gauge” materials (make parts thinner). Government legislation can be enacted to support such measures, as well as to require plastics manufacturers to get involved in the disposal of plastic items – a responsibility long imposed on packaged-goods manufacturers in Europe. 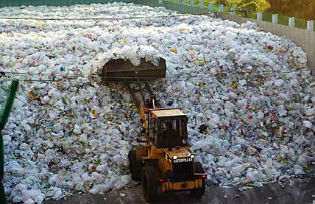 An example of successful waste management is the reprocessing of PET bottles (made of polyethylene terephthalate) into polyester fibers. In the last decade, Japan passed several laws obliging both businesses and individuals to separate plastics waste. This, combined with a lack of landfill space and the country’s expanding population, has enhanced plastics recycling efforts. As a result, in 2010, Japan recycled 72% of PET bottles, compared to roughly 30% in the US and 48% in Europe. While incineration and landfilling are still practiced, such high recycling rates underscore the positive impact of targeted policies. Another promising development is bioplastics, which have begun to compete with petroleum-based products in certain short-lifespan applications – such as packaging and agriculture – over the last two decades. Given that bioplastics are produced from renewable or “bio-based” sources (cellulose, starch, and glucose) – and, in some cases, through microbial fermentation – they have a lower carbon footprint, contribute less to global warming, and biodegrade to small molecules. But bioplastics are not a silver bullet for managing plastics waste. In fact, they may threaten the secondary recycling of petroleum-based plastics, owing to possible contamination during sorting of mixed streams. And critics have expressed concern about the environmental impact of corn and other crops grown for industrial purposes, such as plastics and ethanol production, not to mention the potential effects on global food prices. In a world that is reliant on plastics, more sustainable production, consumption, and disposal of plastic products is crucial. Civil society, industry, and government must work together to increase the share of recycled plastics, thereby ensuring that plastics’ costs do not outweigh their benefits.